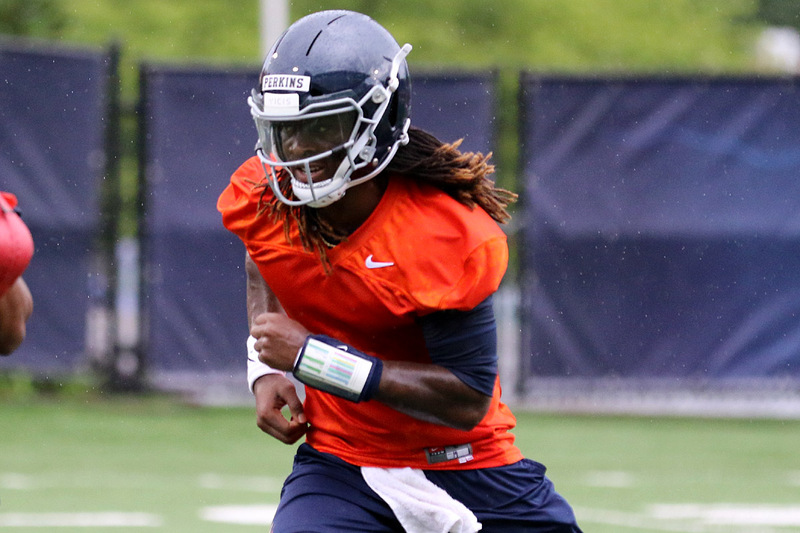 Virginia quarterback Bryce Perkins gained his team’s trust in the spring and summer. Now, he’s trying to gain the experience he needs to lead them to a successful season. The next step in that process began Friday night as UVA opened preseason practice for the 2018 season. Perkins, who coach Bronco Mendenhall named the starter at the end of spring practices, now has a little less than a month to get ready for the season opener on Sept. 1 against Richmond. That’s how Perkins basically described the first day of fall practice (read some EDGE board notes on practice here; check out photos here) overall. Good, but room for improvement. The junior noted that the Virginia offense started slowly in the first team session of the day, but adjusted some things from session to session and improved as the night progressed. He said the first day ended up as a mix of results. There were some mistakes, which included an interception according to Juan Thornhill, who said he picked Perkins off after a near miss earlier in practice. There were also some big plays, including some long touchdowns, and Perkins mentioned Hasise Dubois having a good day. Overall, however, Perkins said he is much more comfortable with his Cavalier teammates than when he arrived in January or even during spring practice. The QB and his teammates have had a chance to work together on the field for weeks this summer and that’s helped improve timing and recognition between everyone on offense. Veteran options like tight end Evan Butts, receiver Olamide Zaccheaus, or running back Jordan Ellis can help the transition since they can recognize the option adjustments on routes based on coverage reads. That’s the exact path of development that Mendenhall knows Perkins needs to travel. So even though “Bryce has been more that what I expected,” Mendenhall said, the Virginia coaches still recognize the need to increase the total number of reps and total number of plays the quarterback sees this month. That led to a voluminous day of work, even though it was the first day of camp with no pads in sight. The Cavalier coaches want to accelerate the preparation period for Perkins to make sure he gets “enough” looks to be ready to handle opposing defenses in the coming weeks. They believe that a combination of recognition and decision-making are the key for Perkins because he has the other tools to be successful. He’s shown good mobility in the pocket and the arm strength to make the needed throws. Receivers coach Marques Hagans said Perkins has the accuracy required too. And at this point anyone following the Wahoos has heard about his speed. Reportedly, UVA Director of Football Development & Performance Shawn Griswold tagged him at approximately 22.2 miles per hour via GPS training devices this summer. Perkins confirmed that number and noted that he had hit 21 miles per hour in pads in the spring. In other words, the Hoos believe Perkins has the tangible skills to lead them to wins and the possibility of their first back-to-back bowl games since 2004 and 2005. In fact, they believe he is their best shot at that goal. Mendenhall made no secret of how important Perkins is in that sense because there remains a significant gap between his experience level and production compared to back-up quarterbacks Lindell Stone and Brennan Armstrong. That means Virginia needs to strike a balance between preparation in practice and eventually in-game punishment as well, though there’s not a magic number of hits in that sense. Mendenhall added that Perkins did have a knack for knowing how to avoid unnecessary hits when he showed up in Charlottesville. The Cavaliers faced a similar scenario with Kurt Benkert at quarterback last season and tried to protect him from potential injuries by telling him to avoid unnecessary contact. That might mean throwing the ball away to avoid a hit or running out of bounds or getting down on scrambles. Benkert’s strength was as a pocket passer and that meant he likely wasn’t going to break open a play with a scramble in the open field anyway. The temptation when there’s a big gap between your QB options could be to give similar instructions to Perkins this season. No coach wants any quarterback taking any unnecessary hits, of course, but the coaches are more willing to let Perkins run in the open field since he has the ability to break a small gain into a bigger one or even a long touchdown run. Plus, the Cavaliers really want to raise the Virginia program to consistent success in the New Standard era. The other QB who Bronco was referring to about not getting down was Taysom Hill who never slid or ran out of bounds and was injured three times as a result.